Ok, so I know the real Tiramisu Recipe has raw egg yolks in it. It's rich with mascarpone and has cocoa powder on top and not all this chocolate fudge on top. A couple of things about me on that subject. I always worried about salmonella. So I decided one day since everyone loves this dessert I was going to make it as close as possible without the eggs, and make sure since us Italians eat all day from noon to dusk, if it sat out I wasn't going to make anyone sick. Sorry about the pictures not being clear, this day had horrible overcast, but being able to have our dinner out on the patio in mid-March was awesome, Florida has had cold months this winter so no complaints, to us it was beautiful a cloudy 78 degrees. Having a special family gathering this 2010 Palm Sunday and this was specially requested, we started to put different ingredients in here that everyone liked. I used Frangelico instead of Kaluha this time, and this has a combination of Nutella and Hot Fudge on top. Loosely translated, tiramisù means "pick me up," and it has been picked up on practically every menu in America. Since the early eighties, it has been one of the most famous Italian-American desserts, and like spaghetti and meatballs, it is far more prevalent here than in Italy. I Love No Bake Recipes! Purchase one angel food cake and slice or make a sponge cake (recommended )homemade easy great recipe or use store-bought. This is a simple version, not made with raw egg, a favorite of ours we make often. There are two versions of this delicious no-bake filling cheesecake. One using ladyfingers and sponge cake that's homemade in a springform pan. The other is using a rectangular shaped pan with either homemade sponge cake or store-bought angel food cake and no ladyfingers. Of course, the presentation using the ladyfingers takes a little more time. This is the traditional look of tiramisu. This pretty version takes little time to make a great eye-opening dessert. You can use all store-bought or homemade ladyfingers and sponge cake. The Filling is No Bake! I love the filling that this is a no-bake dessert. Of course, you can make all the cake from scratch, but the filling is no bake. You can also substitute the liqueur with vanilla extract or even a syrup found in bakeries that is coffee flavored. If you're in a hurry try it all in one pan! Sometimes I need to bring this along to a party. I found it much easier to do it all in one sheet cake pan. Layered with cake and filling. The cake is then cut into squares and topped with a garnish of canned whipped cream and dusted with unsweetened cocoa powder. 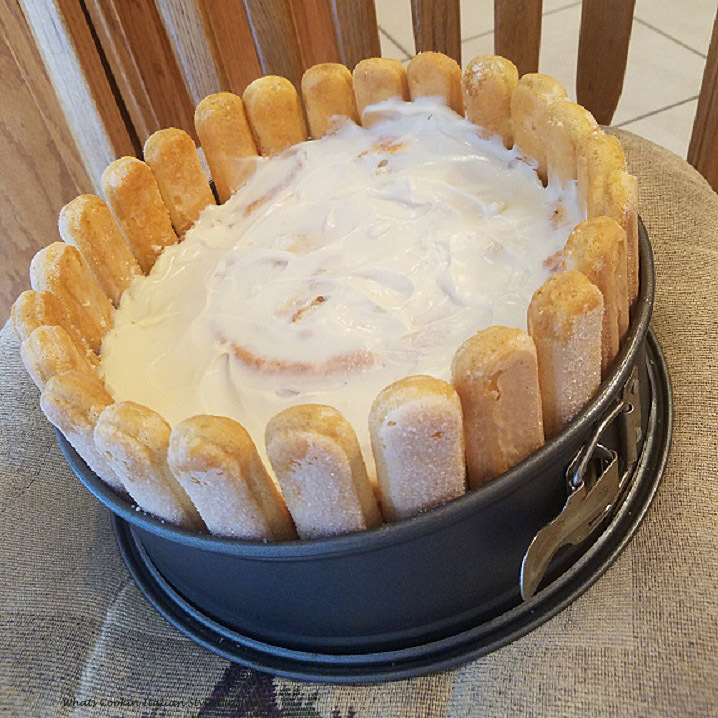 I used a store bought angel food cake to layer this one. I then split the cake in half, sliced it and layered it with the cheese mixture to fit the rectangular pan. The tiramisu was easier to cut for a crowd and tasted delicious. This version is less sugar content as well and you can add sugar-free hot fudge topping and real whipped cream with a sugar substitute to sweeten it. It's a healthier version and diabetic friendly. Everyone raved about the filling and couldn't tell it was sugar-free! 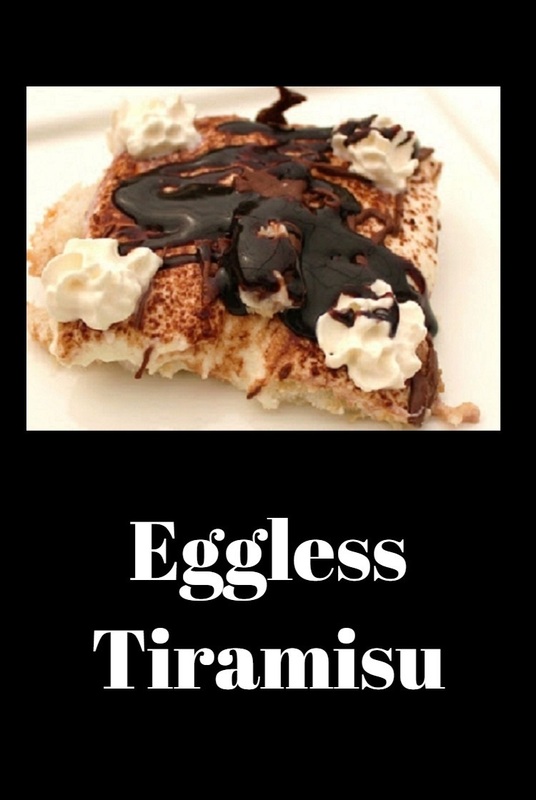 Eggless Tiramisu is delicious and easy to make! This eggless tiramisu is so easy to make. It really has simple ingredients. If you want to change this up a little you can even top this with strawberries dipped in the chocolate for a pretty presentation! Don't miss trying this eggless Tiramisu! Whether you make this tiramisu a show stopper or in just one big pan, it will be a hit at any family and friends gathering. Don't forget to try my grandma's sponge cake recipe when you have the extra time! If you can't find the mascarpone cheese, just use all cream cheese in its place. It still is creamy and a delicious dessert. Easy to adapt to sugar-free low carb desserts! Just remember you can make it all sugar-free. Just use sugar substitutes to sweeten the whipped cream and use sugar-free hot fudge products. Ladyfingers, angel food cake, and sponges cakes are all diabetic friendly. 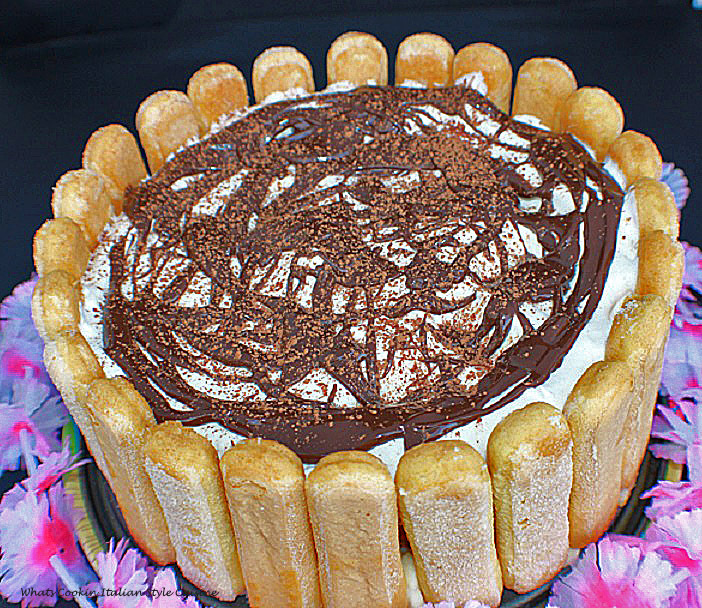 This is a no-bake Tiramisu with cheeses and cream with a layer of sponge cake laced with a coffee liqueur and made in a springform pan. A version of the classic Italian Tiramisu. If using the springform version, place the ladyfingers all around the rim of the pan. Brush the ladyfingers with coffee mixture. Then put one layer or sliced angel food or sponge cake on the bottom of the pan using half the cake. Layer with cheese mixture. Top with whipped cream. Hot fudge sauce, garnish with unsweetened cocoa powder. If using the 12x9 pan, prepare and slice sponge cake for 12x9 inch pan or cut store-bought angel food cake, to fit pan. In another medium bowl, beat the mascarpone cheese, cream cheese, and powdered sugar until smooth, add a half cup of sour cream. Spread cheese mixture on top. Top next with whipped cream and hot fudge chocolate. Spread the top of the round 9-inch springform pan with whipped cream then dust with unsweetened cocoa powder. Note: I added canned whip cream to a slice of a cut piece when serving the 12 x 9 pieces, and then drizzled hot fudge and nutella on top sprinkled with unsweetened cocoa powder. Mascarpone cheese is a soft, sweet Italian cheese, similar in consistency to soft cream cheese. Commonly used in dips and in sweet dishes like tiramisu, it's generally found in the cheese section of the supermarket, you can use cream cheese if you can't find it. Try some of my other no-bake desserts! So yummy Claudia. I wish you could cook for me! Tiramisu is my very favorite dessert! I think I'd prefer this version without eggs too. Very concerned about salmonella too. But I was assured that eggs these days are free of salmonella, at least in UK. The reason... antibiotics in chicken feed!!! I'm not doing a lot of visiting this week, but I need an hour of "normal." Your blog lifts me and your words to me were perfect. Thank-you. Oh my, Claudia! This is a beautiful dish. I could eat a pound of that right now. I'm so glad to be going through your recipes again!! This is excellent. I have a treat a week, and this looks like the perfect treat for this week! I always strive to make satisfying desserts without eggs so my mum can indulge without worry, so , this is just up my alley! Who cares if it's not 'authentic' or traditional? It looks amazing and with you making it, I know it will be fabulous! Yum it looks fantastic, love the Nutella & Frangelico combination! Oh this is definitely going on my list to try. I adore tiramisu and who can resist nutella? What a wonderful recipe. The pics are perfect!! It looks truly delicious!! Geniuses! What a unique twist on tiramisu! I've never been a big fan of the traditional recipe - this looks much better! Fabulous, simply fabulous. I was sold upon the first glimpse. Happy Easter! Another dessert temptation on your sweets trend. This version without eggs it's perfect for me! The Nutella is a really fun touch. What a tasty dessert. Nutella and frangelico...ahhhh... I think I'm in love! While I've never actually made tiramisu, I simply adore it. I'm thinking this would be ideal on my Easter table! Okay... I'm trying this ASAP! Nutella, hot fudge AND Frangelico? I think I about died and gone to Heaven! Annette made this for dinner tonight. It is awesome! She licked her plate, the knife, the spatula and her plate when she was done. Love Tiramisu and you have very well explained it. Love that this is egg free - my little guy misses out on so much because of an egg allergy but will love this! Tiramisu is one of my favourite desserts and your version looks DELISH!! Wow - your tiramisu is definitely the kind of "pick me up" that everyone would enjoy! Beautifully decorated too! Tiramisu is one of my favorite desserts! I also make it without eggs. Love the idea that you placed ladyfingers around the tiramisu. 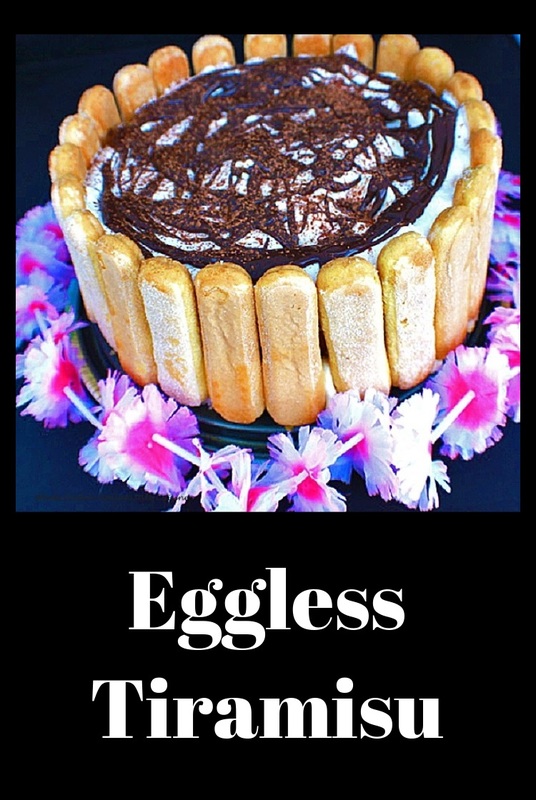 I'm a huge fan of tiramisu and I love that you made this eggless. It also looks absolutely fabulous! I can't wait to recreate this recipe! I had no idea you could make an eggless tiramisu. Looks yummy! Never would have guessed you could make tiramisu without eggs! Great recipe, especially if you'r on a specific(egg less) diet! Now I want some tiramisu! You tiramisu looks delicious. I love your eggless version which is great if your hosting an allergy friendly party. Tiramisu is seriously one of my favorite desserts!! This one looks incredible! I love tiramisu so much!! Now this makes me wanna make some right now!! What a gorgeous tiramisu presentation! 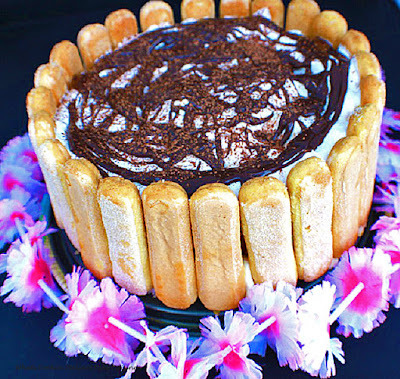 I'm going to have to try this soon---my oldest loves tiramisu! I love tiramisu and have probably eaten my weight in it - this looks so good - saving it to try soon! I love tiramisu. Nothing beats the perfect dessert after a wonderful meal. I love that this is eggless which means everyone cake enjoy one desserts. Saving for later. I love tiramisu cakes. They are so light and perfect for summer time. Your cake looks really fantastic. It's decorated very lovely. 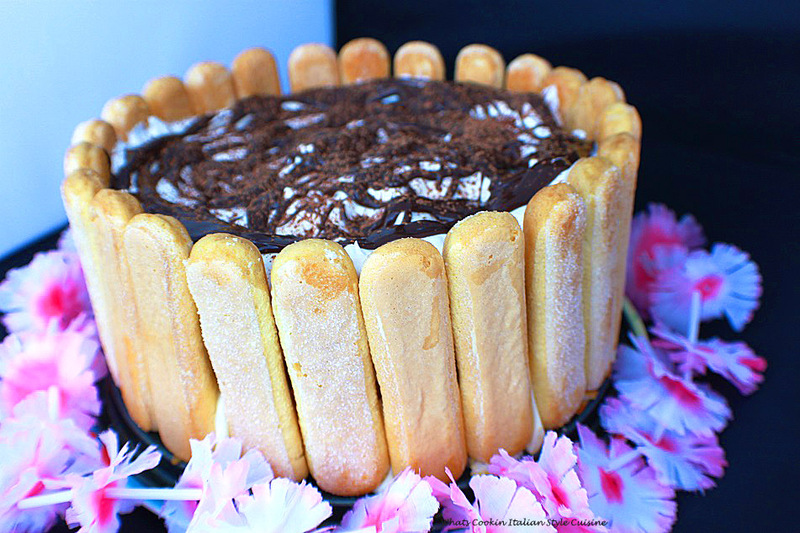 Tiramisu cake is gorgeous, I never thought of making it eggless, I need to try it.Perfect dessert for anytime. Tiramisu is one of my all time favorite cakes. Your Tiramisu recipe sounds so light and refreshing (I love the no bake filling) just perfect for summer! Saving to give it a try. Love No Bake desserts!! This is absolutely gorgeous and you make it look very easy to make. This looks delicious! Glad you've figured out how to make it without eggs! I personally was never concerned about Salmonella in eggs. I grew up eating raw eggs beat up with sugar as a dessert and I think in those days the eggs were not even pasteurized. They are right now so I guess the risk is lower, BUT you'll never know so it is really good to have handy Tiramisu recipe that does not require raw eggs. It's definitely a keeper.